One of the most popular automatic pool cleaner, the dependable Polaris 280 easily connects to a dedicated pressure line. For pressure cleaner applications, the Hayward booster pump is the most energy efficient, reliable and easiest to install in the industry. 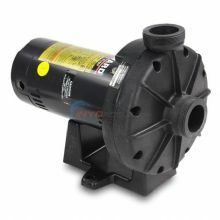 Requires a separate filtration pump for proper operation. 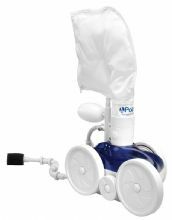 Made by Maytronics, one of the worlds largest manufacturers of robot pool cleaners, The Dolphin Poolstyle cleaner is suitable for all types of pool surfaces. The Dolphin Poolstyle Plus is the robot of your dreams on an affordable budget. This lightweight, small robot is ideal for all types of small pools. Cleans the pool floor and walls. The Dolphin Poolstyle Advanced Cleaner is the robot of your dreams on an affordable budget. This lightweight, small robot is ideal for all types of small pools. Cleans the pool floor and walls. 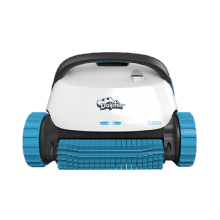 Advance to a new pool cleaning experience with this top-of-the-line robot that brings even more ease and freedom to the advanced capabilities of Dolphin S robots. Control your Dolphin S 300i through the multi-function power supply or use the MyDolphinTM app on your smartphone or tablet to set up cleaning programs and control the robot remotely, including manual navigation. The blinking LED on the robot indicates the active mode. The Dolphin Supreme M3 is the idela pool cleaner for pools up to 10m (33ft) in length. This cleaner will happily clean the floor of your pool, including the difficult to reach angle where the floor meets the walls. The Dolphin Supreme M4 Pro Pool Cleaner will clean any pool up to 15m (50ft) in length, and will do so efficiently using the robots advanced systems to ensure accurate scanning for systematic coverage of floor, walls and water-line, leaving clean and hygenic water throughout. The Dolphin Supreme M5 is designed for pools up to 15m (50ft) in length. The Supreme M5 will enable you to maximise your pool enjoyment - thanks to remote controlled setup and cleaning programs that delivery maximum cleanliness and hygiene. 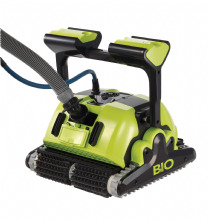 This cleaner will expertly clean the pool floor, walls and waterline, without intervention. 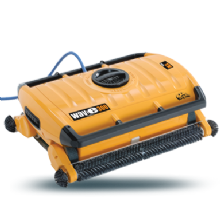 The Dolphin Wave 50 is suitable for pools up to 15m (30ft), this heavy-duty automatic pool cleaner thoroughly scrubs, vacuums and filters the entire pool floor, walls and waterline, leaving the pool sparkling clean. The Dolphin Wave 100 is a highly efficient fully automated cleaner suitable for hotels, campgrounds, school pools, and other commercial applications. 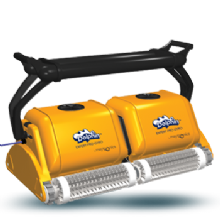 The Dolphin 2 x 2 Pro Gyro puts the power of two robots to work at once, its heavy duty, dual brushing action with high capacity, ultra fine filtration systems and a sophisticated gyroscope, expertly cleans the entire pool floor and walls with maximum effectiveness and efficiency. The Dolphin Wave 300XL is suitable for pools up to 25m - 60m (82-197ft) in length. This cleaner is capable of meeting challenging requirements of the biggest and busiest pools. The Robotic cleaner is fully automated in cleaning shallow pools as it is the only robotic pool cleaner that can work in 20cm deep. The Dolphin Wave 20 is perfect for cleaning paddling pools as it delivers efficient cleaning that will save time and man-hours. It also can be used in commercial environments showing its adaptability as it achieves outstandingly clean pools suited for the youngest users.